When the needs of friends or family members become too great to address on your own, or if you are living at home and require more assistance than you used to, you may be considering adding help to your home or moving in to a care facility. Helping Hearts Foundation is a highly connected care network with many professionals and caregivers at different levels involved. We pride ourselves on finding the appropriate care for each person in need, and in providing a comfortable living environment for all. For some, this may mean getting in-home assistance from a qualified caregiver, while others may prefer to move into an assisted living or independent living community. As needs change, we help each person find the appropriate care for their situation or condition, so they can live comfortably and securely. All of Helping Hearts care coordinators are licensed Residential Care for the Elderly (RCFE) Administrators through the California Department of Social Services, and we also work with those with disabilities, injuries, illnesses and other obstacles. We work quickly and effectively to find the appropriate care when it is needed and never leave anyone forgotten. We believe everyone deserves to have a place they can call home, enjoy modern comforts and amenities and live without fear or uncertainty. With a wide network of care providers, assisted living programs, respite care, hospice care and other services across Northern California, Helping Hearts Foundation works to make this possible for everyone, whatever their situation. Our placement services include a vast range of in-home care services and residences for people with any needs. We understand the importance and weight of living arrangements, and we provide additional options without taking away anyone’s independence or freedom of choice. When living at home or with friends or loved ones becomes stressful, dangerous or inadequate, having options allows you to choose the location or services that best suits your lifestyle. There is no one-size-fits-all when it comes to your life, which is why we explain each service and location carefully so you or your loved ones know which is best for you. Our caregivers and staff are professional as well as considerate and understanding, and we strive to make these transitions as easy as possible. As needs and situations change, we are happy to help find additional assistance, or locate living arrangements better suited to your lifestyle. Are Helping Hearts Placement Services “One Size Fits All”? Some needs are easily met and requirements are simple, while others require a great deal more attention and care. With over a hundred years of combined experience in social services and healthcare fields, Helping Hearts’ staff has seen situations of all kinds and understands each person’s needs. Some may not be aware of all their options, while others may have financial limitations and others may have conditions that require specialized care. We will go through care communities and services that might be a good fit for you, so you can choose the right one. In this way each person may maximize their independence and find the ideal living arrangements, without putting strain on family or friends. When each person gets the care they need in a supportive environment, this translates into better health outlooks, less stress, decreased pain and discomfort and an overall improved quality of living. What Type of Assistance is offered with Helping Hearts’ Placement Services? There are many different forms of care and assistance available through Helping Hearts, with each conducted by trained and certified healthcare professionals. The first option is in-home assistance, which covers a wide range of services conducted in the patient’s home. This can be customized to your needs, whether you require a few hours of assistance each week, a daily visit, or even around-the-clock care. For those struggling with cooking or cleaning, but wish to stay in their home, this is an ideal solution. In-home assistants can also help with other tasks such as driving, shopping, medication schedules, or other needs such as bathing, dressing or getting around. If living at home has become burdensome or lonely, moving to an independent or assisted living community is also an option. These communities provide varying levels of care provided by trained caregivers, as well as a stimulating social environment. 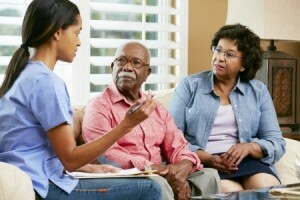 Once again, the level of care you need can be customized or changed as needs change. These communities allow you to maintain your lifestyle without the worries of living alone, and eliminate risks of accidents or injuries. Respite care is a middle-ground between in-home care and assisted living, which includes a short-term stay in a care facility. Short-term accommodations give at-home caregivers such as friends and family members temporary relief or allow them a short absence. Respite care may be in-home or out-of-home, and there are many different types and locations. For those living with advanced-stage illnesses, friends and family often to not have the time or skills to provide comfortable care. Hospice care services focus on the best quality of life during these difficult times, and on comforting and supporting all involved. Contact us to learn more about Sacramento housing and placement services throughout Sacramento County, Sutter County, El Dorado County, Placer County, Yolo County & San Joaquin County – learn about each location and service we offer. We will help you find the right place for you or your loved ones, no matter what services you may require.